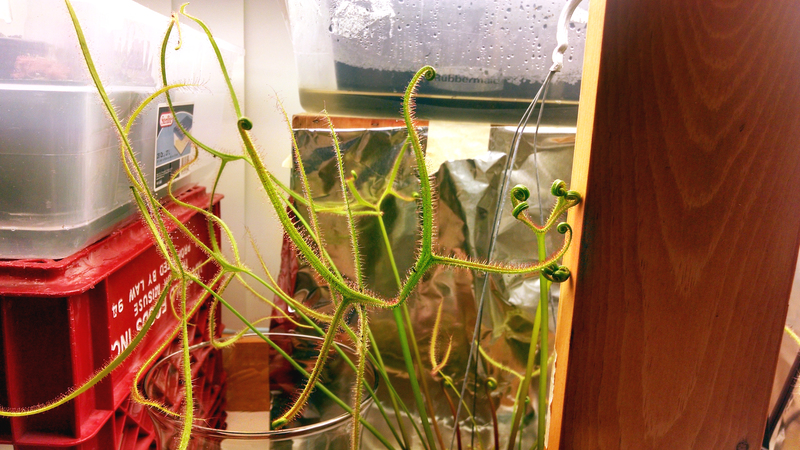 Drosera 'Marston Dragon' is uh, really big |Sundews Etc. Last night I was browsing my plant blogs, and I noticed that the Cactus Jungle had updated the "What's New" section of their website. 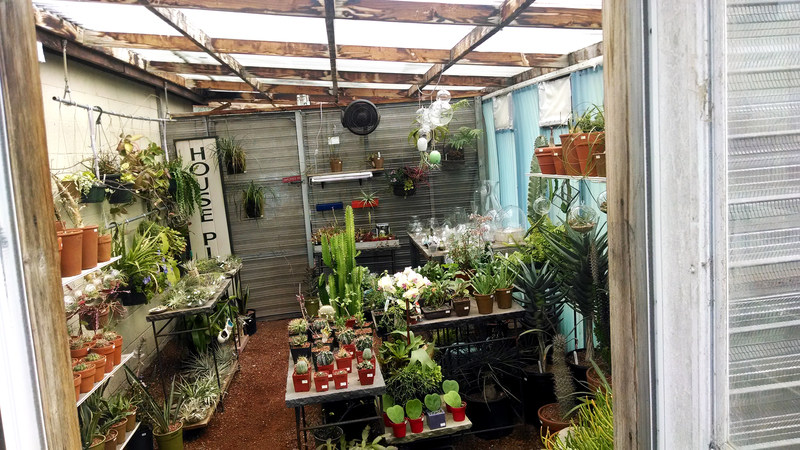 I love this section, because once a month it makes me go out and spend a bunch of money on plants. 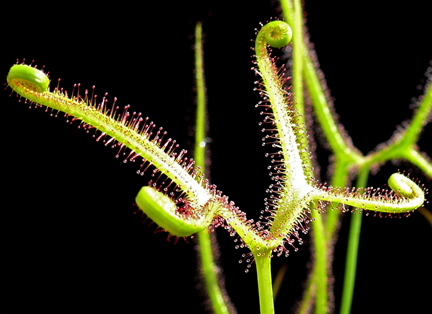 This time, near the bottom, they had a picture of Drosera binata 'Marston Dragon'. This photo belongs to the Cactus Jungle. How exciting! I've been wanting a form of D. binata, and I'm always happy to take a trip to the Cactus Jungle. 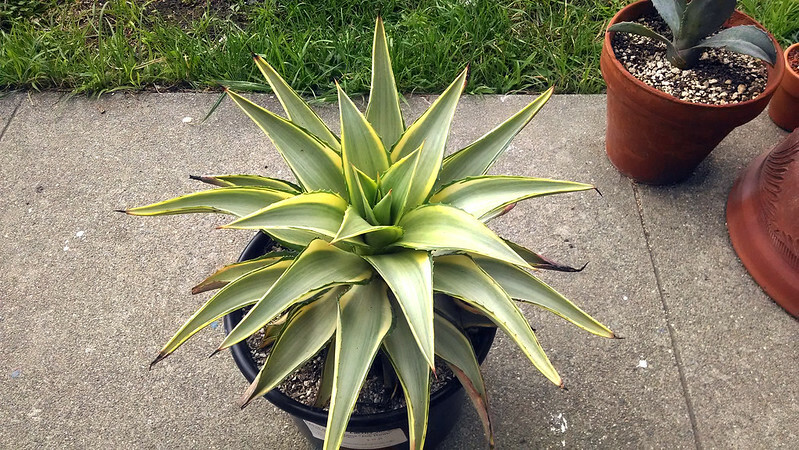 I was also eying some of their new agaves too. 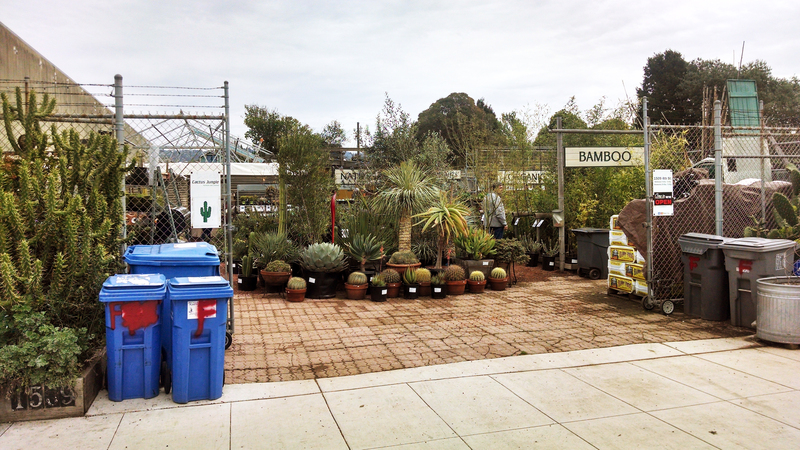 The Cactus Jungle is a small nursery in Berkeley, CA specializing in cacti and succulents, bamboo, and California natives. They've also got a truly impressive selection of Tillandsia and a small but well-tended carnivorous plant section. This is the place that got me into collecting plants of all sorts, and is where I bought my first sundew, the Drosera capensis that's flowering up a storm right now. I have a soft spot for these guys. I suppose I should have taken another photo in situ, but the 'Marston Dragon' ended up being huge. Like, really big. From the website photo, I was expecting something 5 or 6 inches high, ready for some serious growth this upcoming season. Here it is at home, after I re-organized my entire collection to accommodate it. The 2 or 3 longest leaves are 18 or so inches from base to tip, and there are at least 3 separate rosettes in the pot. It's currently drooping under its own weight, and given free reign would splay out about 2 and a half feet across. It's a serious plant. There are a couple of hitchhiking D. capensis in there (big surprise), including an 'Albino'. Also pictured are my Utricularia sandersonii "blue" on the left and U. livida on the right. Fitting a plant that's probably quadruple the size of my biggest D. capensis under my lights was an engineering challenge. I ended up using 2 milk crates and an old wine box we had laying around, and have now used pretty much 100% of the growing space available with these lights. I'm happy I got it all situated. 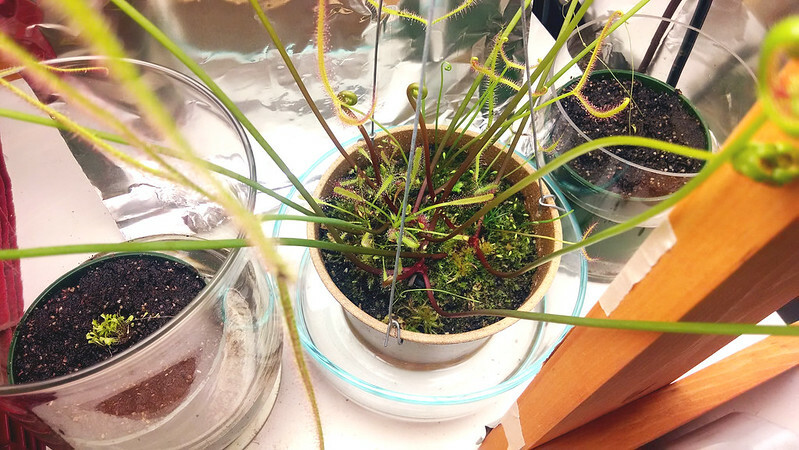 Aaron over at Grow Sundews says that while D. binata forms can get droopy with size, they'll be upright and bushy if given bright enough light conditions. We'll see in a couple weeks. 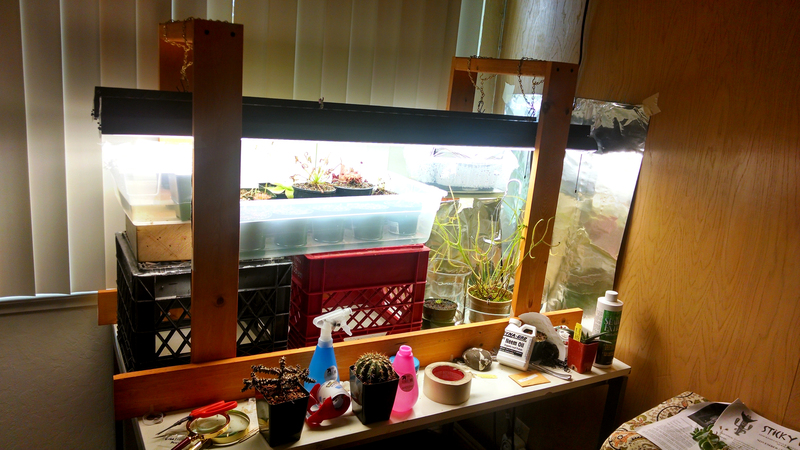 In any case, one of the owners at the Cactus Jungle said they got a great deal on some high output T5 bulbs and fixtures from a wholesaler recently, so I'll be able to add some more bright growspaces. So much to look forward to! Also at the Cactus Jungle today I picked up a lovely Agave desmettiana 'Joe Hoak'. It's got this beautiful opalescent variegated coloration and a uniquely cascading, urn-like shape. A real looker! I really love the Cactus Jungle. 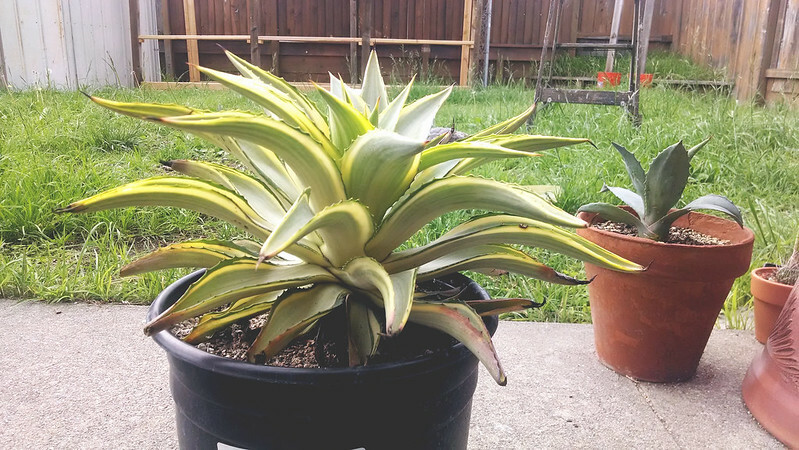 I can't wait to start getting leaf cuttings of the 'Marston Dragon', but I'll have to have some more lights set up first. Until then, I'll leave you with this terrifying picture, staring into the Dragon's maw. Oh, so you were the one that bought it. I thought they had just rotated that plant out like they do sometimes. 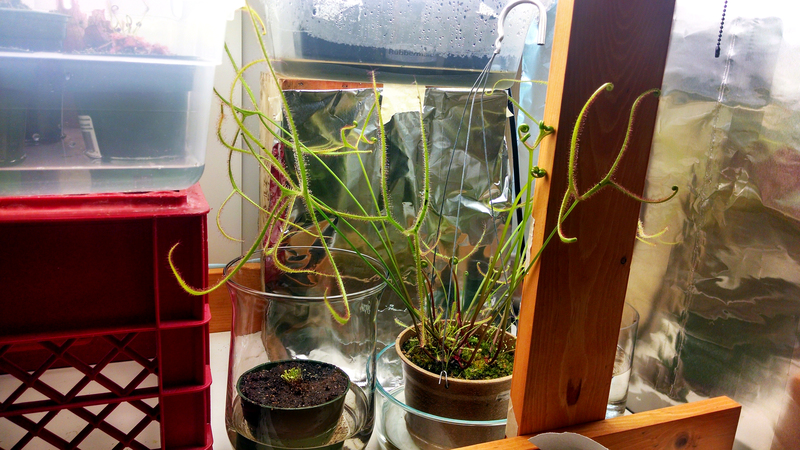 Can you make a post of your Drosera spiralis?